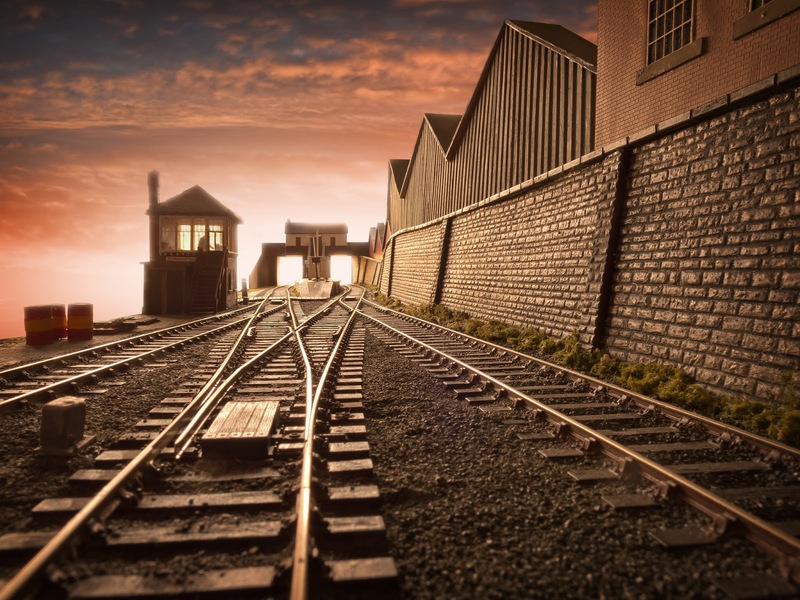 Photo: Buckminster Ironstone, seen from the staging/fiddle yard end taken at the little layout's outing to Railex over the weekend. The loco, which was a visitor courtesy of Paul Marshall Potter, is a tweeked Hornby Sentinel. These inexpensive and very useful small engines are great runners. You can 'Like' Paul's Facebook Toy Chuffer page here. . Click photo to enlarge. This weekend was Buckminster Ironstone's first outing. 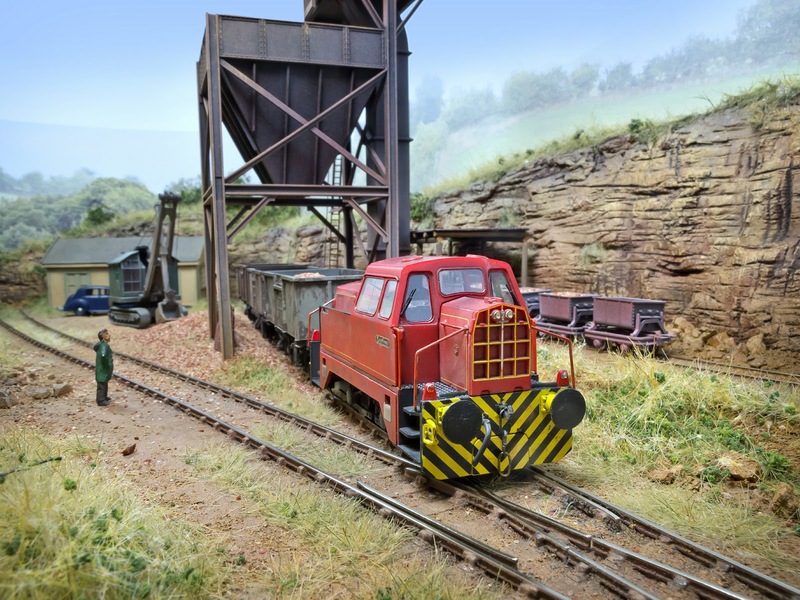 The show of choice being Railex in Aylesbury - a superb and fabulous showcase of some of the best modelling. The tiny layout only has one point, so visual interest was enhanced with actual loading of wagons. Real crushed ironstone was considered, however it tends to produce are large amount of dust as well and clogging up the hopper. A workable alternative was chosen in the form of fine sand, which had been sprayed with a little red primer to give it a reddish hue. This flowed well through the hopper, and with the inevitable spillage, there was the risk that it would get in to locomotive mechanisms, but I was prepared to take the risk, which in the event was not a problem. 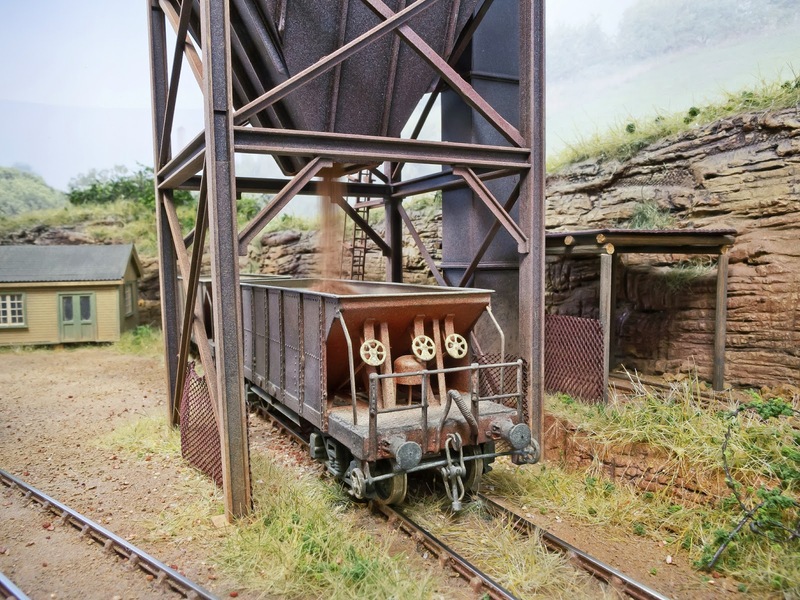 The sand was washed prior, this might have removed any elements such as salt or mud which could make sand grains stick to loco wheels and maybe work up in to mechanisms. Disclaimer for precious or nervous types; If you want to mix sand and toy trains; don't take my word for it - run a test if you want to try this out for yourself. Photo: fine sand caught in action dropping into a hopper wagon. Click photo to enlarge.